Want an afternoon of fun playing with words? Writescape’s dynamic duo will shake up your brains, energize your creativity and get you writing. We’ll explore aspects of character, voice, setting and story. Innovative group and individual exercises will help you take creative risks and explore your narrative voice. Whether you are just starting to write or an old pro, come prepared to play. And come prepared to write. Being creative with words can lead you into new and exciting territory. The workshop was really delightful and useful. The techniques you explained can be applied to any kind of writing and gave me confidence. Ruth and Gwynn work well together, create a safe learning environment, and are such positive people that we can feel free to take risks. Thank you for a wonderful session. I think you did a really great job today. The activities were interesting, the tips were useful and the cookies were tasty! Thank you. I really enjoyed the workshop. And well done on making it feel like a comfortable environment to share and discuss our writing. This workshop was exceptional: both inspiring and challenging. 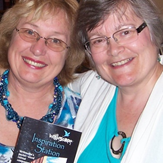 Gwynn and Ruth are strong and supportive teachers who inspire their students. For nearly ten years, Gwynn and Ruth were founding editors and publishers for the literary journal LICHEN Arts & Letters Preview, and until recently, shared an office and job as senior writers and editors at the Ministry of Training, Colleges and Universities. 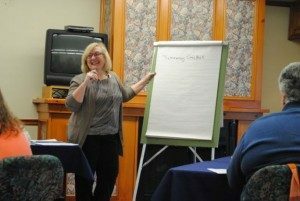 Over the last twenty years, these award-winning and internationally published fiction writers and poets have taught workshops ranging from editing novel manuscripts, to taxation tips for writers, to the art of the short story. From conferences to college classrooms and from intimate workshops to getaway retreats, Gwynn and Ruth have nurtured the creative voice in even the most hesitant writer. GWYNN SCHELTEMA grew up in Rhodesia, now Zimbabwe, and her writing is shaped by that remarkable and rich landscape. Arriving in Canada in 1982, she balanced her practical accounting background with a passion for creativity in both visual arts, radio and the art of writing. As a freelancer, she has been a columnist, ghost writer and course developer. 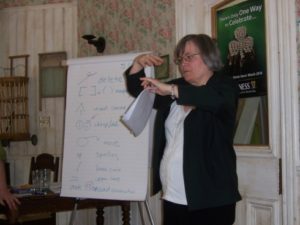 As a poet, fiction writer and professional editor, Gwynn has won several awards for her writing including the 2007 Timothy Findlay Creative Writing Prize. Gwynn is producer and co-host of Word on the Hills, a weekly radio program on Northumberland Radio 89.7FM. RUTH E. WALKER was born and raised in Toronto, lived for nearly twenty years in Southwestern Ontario and is now a long-time Durham Region resident. Published in Canada, the US and the UK, Ruth’s poetry and fiction have won a variety of awards and competitions. She’s delivered writing workshops from Niagara-on-the-Lake to Moose Factory on James Bay. Ruth’s most recent fiction manuscript was awarded a $12,000 Works in Progress grant from the Ontario Arts Council. Her novel Living Underground is published by Seraphim Editions and achieved second printing. Her next manuscript is currently with an agent. Workshop will be held on Sunday, September 16th, 2018 from 1:00pm, 4:00pm at the Lion’s Hall Community Centre in Newmarket. *Please note this is a free event, but space is limited. Pre-registering ensures you get a seat! We cannot guarantee your entry if you do not pre-register.